ETH Studio Basel, Contemporary City Institute is part of the Department of Architecture at the renowned Swiss Federal Institute of Technology Zurich. This institute of urban research undertakes projects that explore the evolution of the contemporary city, looking specifically at how cities transform over time and interact with material space. Currently, the institute is researching urbanization in the Canary Islands as well as in Havana, Nairobi, Casablanca, and Hong Kong. Belgrade. 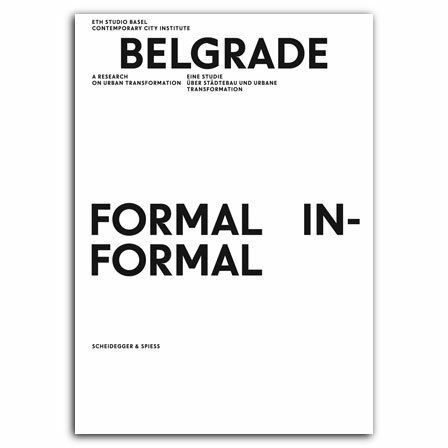 Formal Informal presents the fascinating findings of ETH Studio Basel’s research in the former Yugoslavian and now Serbian capital, investigating in particular the city’s development from the international embargo against the Milosevic regime after the Yugoslavian wars of separation in the 1990s until the present day. This richly illustrated book explores in depth how Belgrade has changed throughout years of upheaval and economic hardship. It shows the result of the interplay between guided and accidental urban planning and construction and the varied architecture that has emerged from that intersection. In essays by architects and urban planners, Belgrade is presented as an example of how contemporary cities develop in an increasingly global community. , born 1950, is an architect educated at ETH Zurich and EPFL in Lausanne and a principal with Diener & Diener Architects in Basel. He taught as a Professor of Design at EPFL 1987–89 and as a Professor of Architecture and Design at ETH Zurich and at ETH Studio Basel 1999–2015. He has also been a visting professor at Harvard University and at universities in Vienna, Amstardam, and Copenhagen. , born 1977, graduated in Architecture from ETH Zurich in 2004 and is a principal with Edelaar Mosayebi Inderbitzin Architects in Zürich. He teaches at various universities and has previously been working as a reserach assistant at ETH Studio Basel 2005–2015.